Detectives need help identifying two armed robbery suspects! Do you recognize them? Our detectives need your help identifying two suspects wanted for armed robberies. The two suspects appear to be two, black males approximately 20-25 years old. 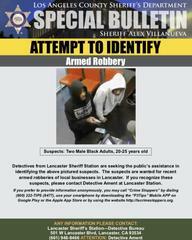 They have recently been robbing local Lancaster businesses at gunpoint. If you recognize either one of these suspects, please contact Deputies Rodriguez or Ferrell at (661) 940-3862. Let’s work together and do all we can to ensure our Lancaster business owners stay safe!